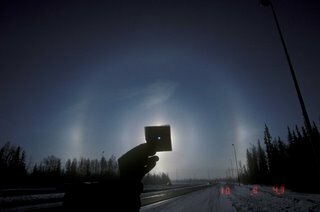 Alaskan town Fairbanks is renowned for it's odd radius halos during the winter. On 10. March 2006 there was odd radius halos but also diffuse anthelic arcs - a treat much less commonly seen in Fairbanks. According to Walt Tape the display lasted for several hours and was different in different parts of town. Outside the town no halos were visible, which indicates anthropogenic origin of the display. In addition to diffuse arcs, another curiosity was also seen: odd radius column arcs. While they are regularly observed in high clouds, in diamond dust they have occurred only once before, at South Pole. The photo above, taken by Tape, shows poorly developed 9° odd radius column arcs as enhancements on the sides of the 9° halo. Very nice halos! Fairbanks is paradise of odd radius halos!